NOTE: For Sl 3 and 4 take 500gms of Green gram(lentil) and sesame for Green gram aavakaya and Sesame aavakaya respectively. 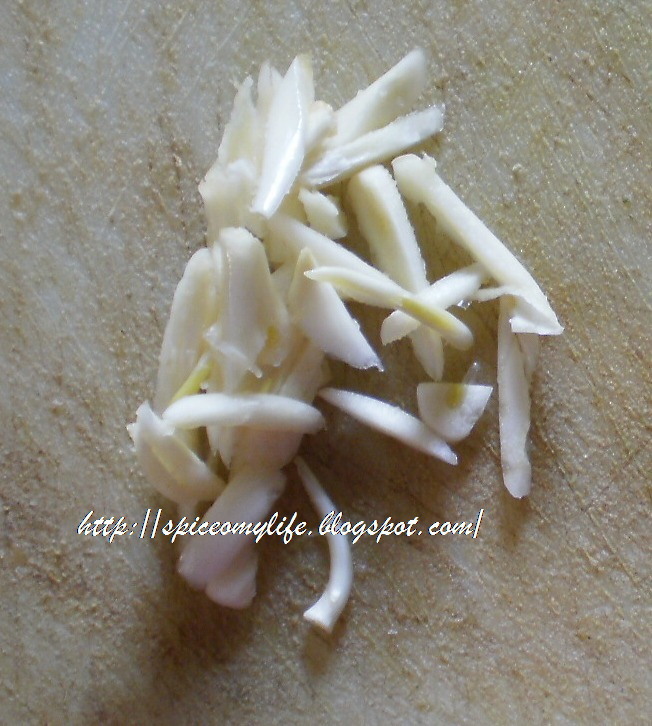 The ingredients are same as in sl 1 or as above for lesser quantities except for garlic. The procedure is same as that in sl 1 too. Apart from that take either 250 gms if the quantities are as in sl1 or 50-100 gms if it is as above- of Garlic. Actually it is according to your taste. Some like only a very light trace. If that is so reduce the quantity of garlic. Peel the pods. You can add it as it is or slice it before adding. This can be added to the spice mixture the first day pickle is being made or on the final day (after 3-4 days) when adjustment of spices is made and the remaining oil is added before storing. It takes a while for the taste of garlic to blend in with the spices say a week or so. 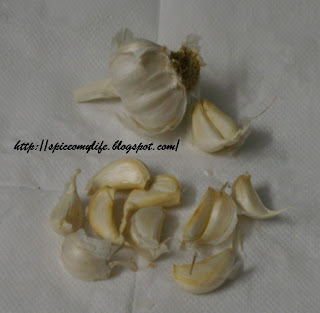 For easy peeling of garlic, separate the pods and place them in a polythene bag and keep in the refrigerator for a day or two. OR place the pods in the sun for few hours. OR heat a flat pan keep on very low fire, add the pods and and roast them for a few minutes, constantly stirring them with a spoon. Take them off the pan, cool and then peel. Mix in salt and turmeric well and then roll in the mango pieces coating them well with the mixture. Store them in a jar after securing the lid properly. Leave for 3 days. On the fourth day separate the juice from the pieces by placing them in a sieve or a fine muslin cloth. Squeeze the pieces for removing the juice in them. Collect all the juice in a glass or ceramic bowl and place it in the sun for few hours or a day. Place the jar also in the sun. After cooling the jar as well as the juice, pour the juice into the jar and store aside. The pieces should be dried in the sun for 3-4 days until well dried. On the 5th day, roast and powder fenugreek seeds. Mix together red chilli powder, mustard powder and fenugreek powder. Add garlic pods as it is or sliced and mix well. Take the stored juice in a wide bowl, mix in the spice mixture by adding little by little. Add the oil and mix well. Put all the mango pieces and mix well. Put the pickle in the jar, cover properly and store. Can be used after 3-4 days. The ingredients are same as for simple avakaya (sl 1). Take very small mangoes. So either increase the number of mangoes or decrease the quantity of spices proportionately. Clean the mangoes and wipe them well. Place a cut in the form of + on each mango and slit in through the stone length wise. The base should be intact and the four pieces should not get separated. Remove the seed inside but the hard shell should not be removed. Mix in all the spice powders well. Add little oil-enough(say one fourth) to wet the mixture and mix well. Keep the remaining oil aside. Stuff in each of the mango with the spice mixture. Place a layer of spice mixture in the jar first. Now place all the mangoes carefully. Spread the remaining spice mixture on the top of these. Pour in all the oil over it. Cover properly and store. Can be used after a week or ten days. The pieces can be separated just before serving or serve the mangoes as a whole. Mix thoroughly, salt, chilli powder, turmeric and fenugreek seeds. Add on fourth of oil and mix well. Coat the pieces with the mixture by rolling them in it. Place them in a jar and keep aside for 3-4 days. Put it in a bowl and sun them for a day in the hot sun. After cooling it thoroughly in the evening, mix in the remaining oil, put it back in the jar, cover and store. Normally pickles are supposed to last for a long time. But I notice that most of your pickles are meant to last just for a week or more. Why? Don't you have recipes for Andhra pickles that last longer? Cora all my pickles which I posted here last a long time- more than an year and even more than that, unless I have specifically mentioned that they don't last long. Though these pickles last for years, still every year we make fresh pickles in the season as the taste of new ones are very good. But old pickles are still used especially those who have fell sick and have weak digestions.